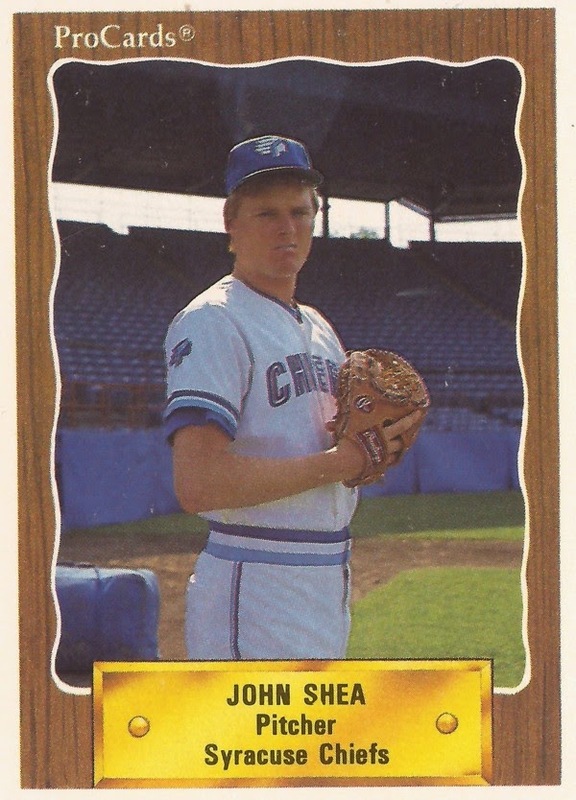 In his eighth season of professional baseball in 1993, John Shea could still pitch. And he pitched well enough in a set-up role to get a vote of confidence from his AA manager at New Britain Jim Pankovits, according to The Hartford Courant. "I hope the organization takes a look at him," Pankovits told The Courant. "A serious look." The organization did take a look at Shea, bringing him up to AAA Pawtucket that year. But they looked no further. Shea's latest attempt to make the majors ended like the others, without a call-up. Shea's career began in 1986, taken by the Blue Jays in the 17th round of the draft. Sent to short-season St. Catharines that year, Shea made single-A Myrtle Beach for 1987. He went 11-5 with a 3.47 ERA for Myrtle Beach that year, pitching four shut-out innings in an August game. He made AA Knoxville in early 1988 and AAA Syracuse in 1990, where he would stay through 1992. With AA Knoxville in April 1988, Shea recorded his first save, inducing a bases-loaded grounder to end the game. He soon went back down to high-A Dunedin, pitching seven innings and striking out eight in a July win. In 1989, Shea retired 11 straight batters in one June Knoxville victory. Shea struck out five and walked two in a June 1991 Syracuse victory. In that game, Shea set down 15 straight batters at one point, according to a wire account. In 1992, his final year with the Blue Jays system, Shea went 8-8 with a 6.18 ERA. In a May game against Toledo, Shea gave up six runs for the loss. That was after he had done well against Toledo in prior outings, The Toledo Blade wrote. Shea went on to the Red Sox system in 1993, getting that promotion to Pawtucket. Then it was the Brewers, Orioles and Rangers systems, one each year through 1996, never getting the call-up to the majors. A stint two seasons later, in independent ball with the Northeast League's Waterbury Spirit, and Shea's career was done.